Home > CarPro Cquartz Ceramic Quartz Paint Protection 30 ml. CQuartz by CarPro is a anti-static, weather-resistant nano coating that protects your vehicle like nothing else! CQuartz works on the molecular level to transform the surface. Once treated with CQuartz, your vehicle will repel water and contaminants, and it will maintain a clear, hard-as-nails finish. One application can last two years! Ultra hard coating. CQuartz contains ceramic nano particles, which create an extremely hard finish that is scratch-resistant and durable. The average thickness of Cquartz layer is between 0.7 µm ~1.5 µm. Weather-resistance. CQuartz provides durable protection against rain, sun, salt, and anything else Mother Nature throws at it. The anti-corrosive coating holds up in all weather conditions. High gloss shine. CQuartz contains nano fiber glass, resulting in a deep, reflective shine. Water and oil proof finish. CQuartz provides incomparably strong water and oil repellency. This hydrophobic effect prevents water spots and oily stains from attaching to the paintwork. Smooth, dirt repellent surface. CQuartz's nano particles fill in tiny swirls and imperfections in the paint to make it perfectly smooth. Therefore, dirt and dirty water cannot settle into any crevices. The finish is also resistant to bugs, UV rays, acids, and salts. Plus, the slick surface is anti-static and washes off easily. Anti Calcium Effect. 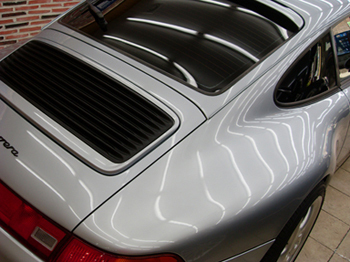 CQuartz prevents mineral deposits from bonding to the vehicle's surface so water spots can be wiped off. Detergent-resistant protection. CQuartz cannot be removed by water, alkaline or other detergents, or by pressure washers. It lasts up to two years! CQuartz can be applied to virtually any surface: glass, wheels, plastics, leather, and rubber. For the best results, prep your vehicle properly before applying CQuartz Ceramic Quartz Paint Protection. Wash and clay the paint to remove all impurities. Polish if necessary to remove imperfections. CQuartz is only a protectant so you want to clean and polish before applying CQuartz. When your vehicle is looking its best, apply CQuartz to freeze it in that condition. It's like pressing pause on your paint. The 30 ml. 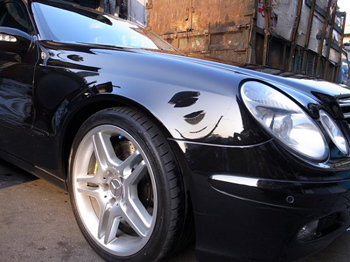 CQuartz is enough to coat a standard size car. An SUV or truck will require 40-50 ml. of CQuartz. Apply very thin and evenly. Wait 10-20 minutes on average. At 30° C. (86° F), wait 5-10 min. At 20° C (67° F), wait 15 min. At 15°C (59° F) wait 20 minutes. Then wipe off gently with soft microfiber towel with short looped fibers. Avoid re-using the wipe off microfiber towels because they will harden and crystallize. Let dry for 1hour at 25° C (77° F) or 3 hours at 15° C (59° F). The coating will dry completely within 48 hours. Working temperature: 15- 30° C (59-86°F). When washing always use a dedicated car shampoo and wash mitt. we recommend washing with IronX Soap Gel. Remove bird droppings from the paintwork as quickly as possible to avoid damage to the coating. Cquartz will protect from those for the first day or two, but not long term. Avoid using automatic car washes. Use our Reload spray sealant to maintain the coat for longer lasting time. How long it takes to do the curing with IR light? Please info..
Wow, my paint is now afraid of water! Used this on my custom motorcycle first. Loved the ease of application (a little skeptical at first but once I got the hang of it, very easy to apply) Let the product dry for a couple of hours. It lasts a long time and kept me from waxing and detailing it again. I used Wolfgang Detailer to renew shine. Next applied it to Jag XK Convertible. It went on easy but one mistake I made was not to prepare the surface and now there are smears on the rear decklid. My fault. I am waiting for the product to wear off but after 6 months it has not . I am not concerned as the overall look is excellent. Use it on wheels and it protects them much better than wax and easy to clean brake dust. Repels water exceptionally well. Does not have the smooth feel of wax, but gives the same shine and overall appearance. I have used Dodo Juice Wax over it and it shines like a mirror. Don't be afraid of this product. It is liquid ceramic shine in a bottle. Saves alot of post application maintenance compared to wax and sealants. Used over Klasse Gloss Sealant for extra protection. Hint. Apply in small panels. The dry time varies based on temperature. Here in Florida it took about 5-10 minutes after application to remove. When removing, thoroughly wipe with microfiber towel. There are no instructions about reapplication. i waited a month to apply the second coat and there is a big difference between the first and second coat in terms of observed protection and shine. Apply second coat sparingly. Also, great on chrome. Motorcycle has a ton of chrome and was hesitant to apply to non painted surface. Tested on smaller chromed parts and then did pipes, handlebars, forks, etc. Looks like a clear coated mirror. The small bottles don't go as far as I would have liked, but to do a decent job on larger surfaces, i would rather have product left over than only have 3/4 of the car done and need to re-order. Highly Recommend. Excellent product! Gloss like you won't believe, incredible hydrophobic resistance to water, vehicle stays cleaner longer and is sooo much easier to wash. I LOVE this product.